Moog Taurus 1 is the classic bass synth used by a large number of progressive rock bands in the 70's and 80's. Because of its cult status the Taurus 1 nowadays is insanely expensive. Mainly due to the cost I don't own one myself. TaurusG2 is an emulation of Moog Taurus 1. It is a basic 2-osc sawtooth -> mixer -> filter -> VCA synth architecture. The addition of overdrive to the VCA input is the key to the Taurus sound. 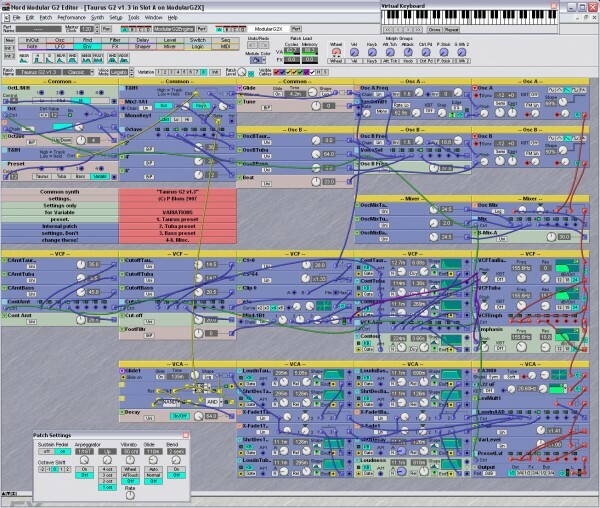 Controls for octave selection, decay on/off and preset selection add a considerable amount of complexity to the patch. At first I planned to use G2 variations for the presets (Taurus, Tuba, Bass and Variable), but this made all the common synth controls (e.g. Tune, Beat, Glide etc.) non-global. Instead, I have implemented within-variation preset switching with a slight twist. When switching preset after key/pedal release, the actual sound change is delayed until next key/pedal press. For demonstration purposes all 8 variations are filled in TaurusG2. This is a demo recording of TaurusG2. Parameter mapping. 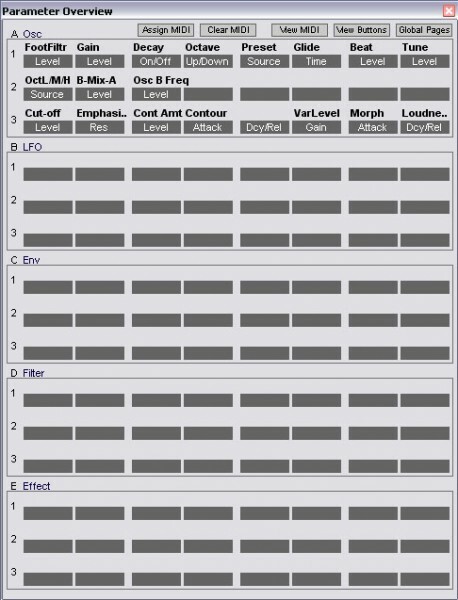 Page A1 contains common controls for all presets. Page A2 and A3 contain the Variable preset controls.